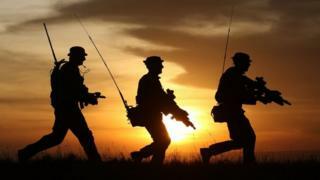 The UK's armed forces need increased funding in order to meet threats from states including Russia, MPs have said. The Commons Defence Committee report said the level of defence spending should rise from 2% to 3% of total GDP. Chairman Julian Lewis said this wo uld also help the UK fill existing financial "black holes". The Ministry of Defence said the UK has the biggest defence budget in Europe and continues to exceed Nato's 2% spending target. Earlier this year, ex-commander of the UK's Maritime Forces Rear Admiral Alex Burton said Britain was in danger of losing its status as a "credible military power" and called for a rise in defence spending. The head of the Army, General Sir Nick Carter, has also previously called for increased spending, saying that Britain's ability to respond to military threats from Russia will be "eroded" without further investment. What's happening to defence spending? In the committee's report, called Beyond 2 Per Cent, MPs said that failure to finance the military on a sustainable ba sis made it "very difficult" to have a long-term defence strategy. Increased spending was the "only solution" at a time when the UK faced a renewed threat from Russia and increasing challenges from terrorism, extremism and cyber-warfare, the MPs said. The report said defence spending was "far too low" and the government "needs to apply the resources that are necessary to keep this country safe". It must move the level of defence expenditure back towards 3% of GDP, as it was in the mid-1990s, it said. The committee warned of "serious deficiencies in the quantities of armour, armoured vehicles and artillery available to the British Army". The lack of vehicle-mounted anti-tank weapons and self-propelled artillery and the need for modernisation of rocket artillery left the Army "at serious risk of being outgunned by its Russian counterpart", it said. In January, Defence Secretary Gavin Williamson announced a new review, the Defence Modernisation Programme, focusing solely on military defence. Mr Williamson has indicated he will demand more money if the review deems it necessary. The review's findings are expected to be revealed in the coming weeks. In December, analysis by the House of Commons Library found that between 2010 and 2015 the Ministry of Defence's (MoD) budget had fallen by Â£8bn in real terms. Since then, spending has stabilised and in the last financial year (April 2016 - March 2017), Â£35.3bn was spent on defence. In 2016, the UK had the fifth biggest defence budget - the highest of all EU countries - a ccording to an international military study. Committee chairman Mr Lewis said: "The government now needs to look beyond the 2% minimum on defence spending, and begin moving towards a figure of 3%, to place our defence policy on a sustainable basis to meet new threats and fill existing financial 'black holes'. "Defence is constantly described as the first duty of government. "The MDP is the government's opportunity to show that it means what it says." A Ministry of Defence spokesman said: "The defence secretary launched the Modernising Defence Programme to strengthen our armed forces in the face of intensifying threats and, while we welcome the Defence Committee's preliminary report, we will not speculate on the outcome of the programme before we share our headline conclusions." Former Republican First Lady Laura Bush condemns Trump's policy after his wife expresses concern. If a house costs too much, how about half instead?